The film doesn't challenge our perception as much as amiably pat it into place, yet -- thanks largely to a remarkably committed performance by the leading man -- the film scores like a champ, feels Raja Sen. The first time it is suggested that Mahendra Singh Dhoni try his hand at cricket, he breaks into that grin we know so well. What good is a sport with such small balls, he laughs to a schoolmate, shrugging off the idea. A pre-teen boy playing football at the time, goalkeeping is more his thing -- until, that is, the cricket coach wonders if he fears the hard red ball. Neeraj Pandey's MS Dhoni: The Untold Story is an odd biopic, a rousing rags-to-riches story that happens also to be a hagiographical picture of a flawless protagonist. This celebration, however, it accomplishes rather effectively. Pandey focuses on the early, raw Dhoni years far more than he does on the more unseemly later dotted with scandal and shade. While this gives us is a rags-to-riches story about a sincere young man destined to win and born to lead, it is still an engaging and passionate enough tale to fill our cricket-partial stomachs, one we can nod happily along to. The film doesn't challenge our perception as much as amiably pat it into place, yet -- thanks largely to a remarkably committed performance by the leading man -- the film scores like a champ. It feels at times like we're watching a highlights package of a game we've already watched and loved, but sometimes that is satisfying enough. The film opens with the 2011 World Cup. We see the back of the captain's head, as he, with his trademark Nadal-esque sleevelessness, watches a wicket fall and pulls his Number Seven jersey on, choosing imperiously to take charge instead of letting the padded-up batter walk out to play. We all know what happened next, an unbelievably timed innings that climaxed with a shot -- one shot I wrote an essay about -- that many of us can never forget. Pandey smartly pays more attention to what came before any of us were watching. To the young boy begging his mother for a Sachin Tendulkar poster. To the puritan annoyed at a friend drinking beer. To the thinker who calculates the time in which he needs to finish an exam in order to reach a cricket game. Walking out to join a more experienced batsman with a steep target on the board, Dhoni asks if the other guy can do it if he gives him the strike. The batsman says he'll try. 'If it has to be tried, I might as well try it myself,' says Dhoni, full of pluck and strokeplay. Playing one of the most famous men in the country, Sushant Singh Rajput doesn't put a foot wrong. Literally. Right from that walk, his body language as Dhoni is immaculate, and he nails everything: the swagger, the trademark shots, the oddly effete nail-biting manner. These slavish Dhoni imitations are superlative enough, but Rajput -- an accomplished and restrained performer -- fleshes out this character of superhuman perfection and turns him into someone real, someone worth believing in and cheering for. The actor makes us believe in Dhoni's hunger, in his earnestness, in the way he embraces responsibility -- in an inversion of the superhero cliche, Dhoni appears to have realised that taking on great responsibility will lead him to greater power. 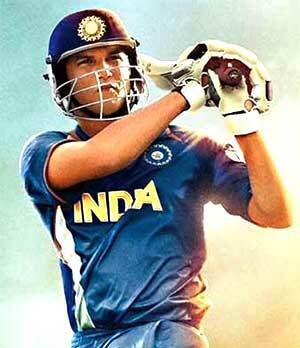 The most pleasant aspect of the film is the way it shows friends and family rally around Dhoni and believe unflinchingly in their boy. Set in Ranchi -- with pink chart-paper school projects on blue and green walls, rubbing shoulders with religious imagery and Sportstar posters -- the film is about the tribe of believers it takes to lift any of us truly high. Dhoni's family, his coach, his friends, his teammates... He might not have arrived yet, but he travels with a pack of supporters, at times a motorcycled convoy. A Dhontourage, if I may. The film brilliantly shows these family members and friends watch Dhoni bat on television, sitting superstitiously in the same positions each time, developing their own match rituals, and growling angrily each time Dhoni gets out, full of suggestions about what he should have done instead -- because of course they know better. It is exactly how too many of us watch cricket, too involved, too irrational, too all-knowing, and, with this masterstroke, Dhoni the film makes us feel like the family of Dhoni the man. The film gives us many moments of Dhoni rising to the occasion -- underscored by brief montages of hapless, helpless bowlers -- but too few of Dhoni struggling. It is as if batting came too naturally and effortlessly to him. Tragically, we don't get to watch him, the canniest and most boldly strategic captain we've had, plot out any of his unconventionally sharp decisions. There are two romances -- with well-cast girls -- but, like the poor songs, these hamper the narrative and slow it down. It is only Rajput's valiant performance that keeps us believing, especially as he stands in front of a mirror and self-consciously practices precisely how wide his grin needs to be. In a bright move, the film uses a lot of actual television footage, ForrestGumping Rajput's face on Dhoni's body and letting him advise Lakshmipathy Balaji and celebrate with Harbhajan Singh instead of casting lookalikes for these parts we know so well. The first time we see Sachin Tendulkar, for example, the film gives him what is sometimes (and fittingly) referred to as God's View, turning the narrative camera into the Sachin character and letting Dhoni walk up to him for an autograph. It's quite a moment. That, in fact, is part of a greater moment, a scene where a pretty girl meets Dhoni on a flight and -- while awestruck by other cricketers -- thinks nothing of MS, who she doesn't yet know. It is a fleeting scene, but teases the idea of a truly good film. We could have had something special, something close to Rush, a proper sports film with conflict and heart and internal struggle. Rajput steps forward and tonks it out of the park, but it would matter much more if this wasn't an exhibition match on a conveniently doctored pitch.